This topic covers METARs, TAFs, PIREPs, AIRMETs, SIGMETs, and SAWs. PIREPs, AIRMETs, and SIGMETs reflect the most accurate information on icing conditions. A ceiling is defined as lowest layer of broken or overcast clouds or vertical obscuration. A METAR is an observation of current surface weather reported in a standard format. METARs are issued on a regularly scheduled basis unless significant weather changes have occurred. A special METAR (SPECI) can be issued at any time between routine METAR reports. A TAF is a report established for the five statute mile radius around an airport. TAF reports are usually given for larger airports. Each TAF is valid for a 24 or 30-hour time period and is updated four times a day at 0000Z, 0600Z, 1200Z, and 1800Z. 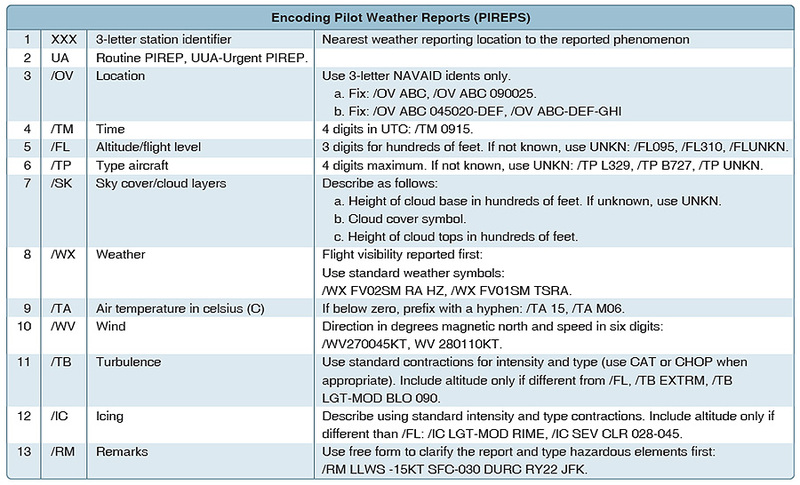 The TAF utilizes the same descriptors and abbreviations as used in the METAR report. PIREPs provide valuable information regarding the conditions as they actually exist in the air, which cannot be gathered from any other source. Pilots can confirm the height of bases and tops of clouds, locations of wind shear and turbulence, and the location of inflight icing. Icing should be reported in terms of rate of accumulation: trace, light, moderate, or severe. SIGMET is the acronym for Significant Meteorological information. A weather advisory issued concerning weather significant to the safety of ALL aircraft. SIGMETs are issued as soon as practical to give notice to operators and aircrews of potentially hazardous en route conditions. SIGMETs report widespread areas of severe or greater turbulence, severe icing, widespread duststorm, widespread sandstorm, volcanic ash. Convective SIGMETs are issued for the CONUS (continental United States) instead of SIGMETs for thunderstorms. Any Convective SIGMET implies severe or greater turbulence, severe icing, and low-level wind shear. The Storm Prediction Center (SPC) issues Aviation Watch Notification Messages (SAW) to provide an area threat alert for the aviation meteorology community to forecast organized severe thunderstorms that may produce tornadoes, large hail, and/or Convective damaging winds as indicated in Public Watch Notification Messages within the CONUS. SPC issues three types of Watch Notification Messages: SAW, Public Severe Thunderstorm Watch Notification Message, and Public Tornado Watch Notification Message. They are available on the SPC Web site.